The post might earn me some grief but I don’t care. Bring it on. 😀 It’s my beliefs so like it or lump it. It’s now a decade this year since I graduated from uni and decided that animation wasn’t for me, believing that a life of writing and illustrating was. I feel that whilst I could have probably moved further in this calling by now, I’m still proud of myself for sticking with it and pushing forward. But maybe I wonder if I could have done any better. Over the years I’ve read many, many books on personal development, philosophy, and a few on meta physics and quantum physics. Now I’m not claiming to be an expert! Far from it! But after a while you tend to read things that click into place for you and just feel right. So here’s my views. I think the majority of us are constantly looking for way to improve our lives and live in hope of a better future, whilst being fully focused on the negative aspects we’re living through. We’re all wondering how long it will take to get to our dream life. Yet most of us aren’t aware that our dream life already exists. And that another ‘us’ is living it. 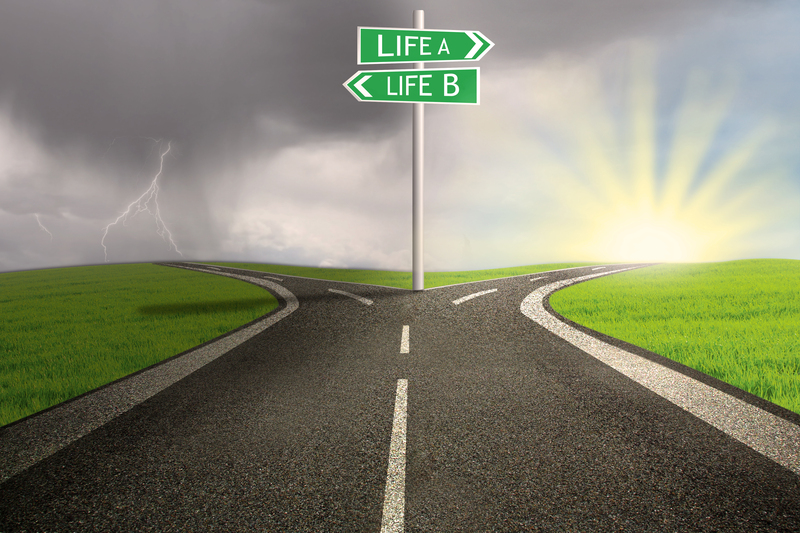 With each choice and decision we make in life, a fork in the road appears, we divide, and one of you moves down one path, and another moves down the other. These decisions happen constantly, big and small, from deciding where in the world to live, right down to where our eyes move at any particular time. These parrallel lives move onwards almost independent of each other splitting off into further decisions each certain they are the only true one. But how does this help us create our perfect life? After all, we can’t forsee each decision and where it will take us. Let’s make an example. We’ll call him Smithy! Now Smithy is sixteen years old. He’s finished school and is deciding where to go in life. Should he go to college? Go straight in to work? Or just become a homeless hobo? Straight away there are decisions taking place. One of these Smithys decides he wants to go to college. The life splits and this Smithy (we’ll call him Smithy 1) goes on believing he is the true Smithy. Smithy 2 who gets a job and goes straight into work believes he is the true Smithy also, as does the third hobo Smithy 3. So life goes on and Smithy 1 goes to college, then university, gets a high paid job, eventually building his own company and living in luxury. Smithy 2 works in low paid jobs in the rest of his life, struglling to get through each day. Smithy 3 becomes part of the dregs of society. But it doesn’t end there. Further decisions down each path alters the futures of each Smithy, drastically changing each. Smithy 1 at some points decides to take a huge risk, splitting off into Smithy 1.2. Smithy 1.2 loses everything and becomes on a par with Smithy 3 – living in the gutter. Smithy 2 decides to take a job abroad, splitting into Smithy 2.2 and gets spotted by a talent scout – eventually becoming a A-star actor. Smithy 3 takes a different route on his daily journey through the slums and divides into Smithy 3.2. He finds a discarded lottery ticket and bingo! He’s up where Smithy 1 was! Now imagine if these decisions happen all the time, every single second, altering and dividing our lives into an unlimited amount of Smithys, split futher by the decisions of every one else on the planet. It’s truly mind-bending. But gives us hope that things can improve if we allow them to. So by this thinking if we concentrate on now, and be open to a better life, then we automatically allow our subconcious to be aware of signs, opportunities and people that will help us get there. For example if you go through life believing all men (or women) are horrible, then your mind will automatically ignore the nice men (or women), making them almost invisible to you whilst attracting you to only the badboys (or bad girls). Once you start believing that things can be different, the enormous amount of changes taking place every single second will propel your life in the correct direction. Through this way you can acquire the dream parrallel life, rather than settling for a mundane one. Being aware will also tune you into your other parallel lives, gaining knowledge of how they got to that dream life. By this way of thinking we should also be respectful of everyone we meet, regardless of their appearance, status, or beliefs. Because you can be certain in another life you have both switched roles based on the descisions you have both made. The prince becomes the pauper. I wonder how Animation Ken got on? He could be writing this exact post on a private beach wondering how Writer Ken got on. One thing is certain, I won’t stop until I’m sat in the same place he is. So keep smiling, be happy, and live in the belief that there are billion of you, experiencing life in every way possible.